Becca McBride earned her Bachelor of Arts degree from Belmont University in Political Science in 2002. She then earned a Master of Arts degree from Georgetown University in Eurasian, Russian, and East European Studies in 2004. At Georgetown she specialized in Chechnya, violent ethnic conflict, and terrorism. While at Georgetown she started working for the US Government as a Russian analyst; she continued as an analyst after graduation. When she relocated back to Nashville, TN with her family, she started as an instructor at Belmont University. After teaching at Belmont for four years, she decided to return to graduate school and pursue a PhD. In 2013, she graduated from Vanderbilt University with a PhD in political science. At Vanderbilt she focused on International Relations and Political Theory. 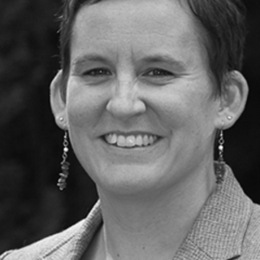 She joined the Political Science faculty at Calvin College in fall 2013 and her research focuses on policy diffusion, child welfare, intercountry adoption, and the role of non-state actors in the international system.